I'm hoping this breakfast sets the tone for my entire day. I love the pretty pomegranate swirls intertwined with ribbons of a Turkish black pine honey a friend gave to me. There are little puffed BBs of quinoa, toasted sunflower seeds, some bee pollen, and creamy clouds of Greek yogurt. It was a fluke, with everything just falling into place after I reached for the pomegranate juice leftover from my ongoing juicing experiment. So, for today, just a quick hi, and hopefully a bit of inspiration to make your next breakfast special. 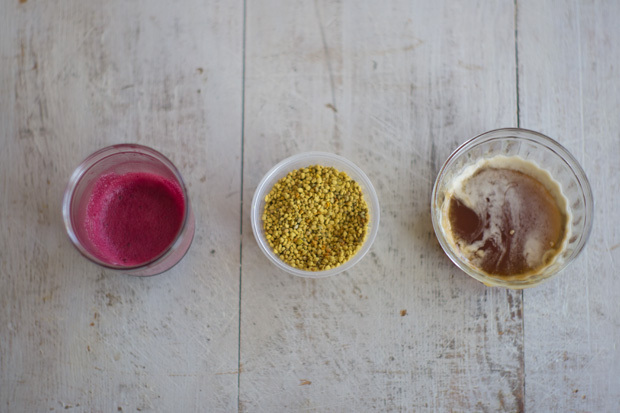 I can imagine cooking down a bunch of the fresh pomegranate juice to make a thick homemade pomegranate molasses the next time around, although I love the brightness of the fresh juice and the way it tangles with the honey and yogurt. HS: After some experimenting with the juicer, I think pomegranates are best juiced by hand. Use a basic citrus reamer and juice it as you would an orange. Strain, and you're set. This is written for an individual bowl, but I'm absolutely going to make a big, family-style version of this for the next brunch I have. 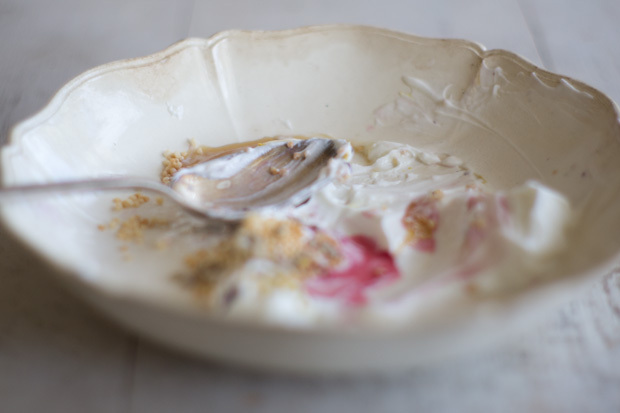 In a shallow bowl swirl the pomegranate juice and honey into the yogurt just a bit, sprinkle with cereal, and sunflower seeds, and then finish with the rose petal and bee pollen (of you're using those). A hot, filling, wintertime DIY four-grain breakfast cereal that you can trick out with all sorts of different toppings. A scrambled egg recipe taught to me by the lovely Lynn from Satsuma Press - herby cream cheese is the last-second finish that make these eggs simple but special. A crumble-topped muffin recipe made with an oatmeal and yogurt base. Craggy, golden-topped, the last thing I'll bake before moving on to a new oven.